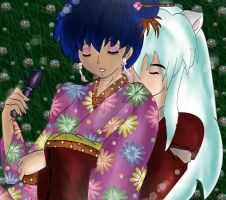 This is for for her request of InuYasha and Kagome having a snowball fight. I hope that she likes it! I feel that my style is easy to identify -especially the eyes I do - so I made an attempt to disguise my style. I can tell you that is realllllllllly hard to do!! Though I think it may have still come through enough. I used a photo for reference and went for a manga style. I love it! they look like they're having a ton of fun! Thanks! I really enjoyed making this! THANKS!!! I so enjoyed making this! Doesn't make you have a sugar high? I really enjoyed making this! You can feel the pleasure in it. Fluff is good for the soul! I am sooooo glad you like this so much! I really enjoyed making this for you so much! You are so very incredibly welcome! I enjoyed making this so much! 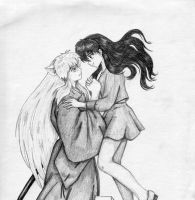 Disclaimer : I do not own nor make any monies off of Inuyasha and the gang. 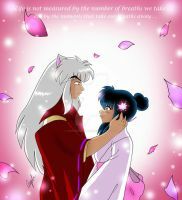 No, that pleasure completely belongs to the Goddess Rumiko Takahashi. I am only using them for pure entertainment value.